Strange mysteries may be found almost anywhere, but they seem especially plentiful and interesting in Australia. Any nonsense that powerful people such as Oprah Winfrey choose to promote is featured as fact, quackery is extolled, and pseudoscience is flaunted in news media rather than on pulp magazine racks. Los campos electromagnéticos ¿pueden crear fantasmas? Si usted está seguro de que los fantasmas son reales (y no el producto de alucinaciones inducidas por CMEs), no hay lógica ni razón alguna para usar un dispositivo para detectar dichos CMEs. If you are sure that ghosts are real (and not the product of EMF-induced hallucinations), there is no logic or point in using a device to detect those EMFs. For ourselves and our society, survival in the current era requires adopting scientific habits of mind. The benefits of statins far outweigh their risks, but public perception has been skewed by alarmist misinformation from statin denialists. Las estatinas, aunque no son la panacea, han mostrado claramente que tienen efectos positivos -más que negativos- sobre los pacientes en riesgo. 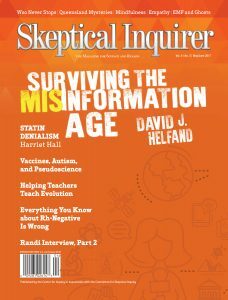 Proponents of the vaccination-autism link have created a bogus scientific debate by providing lists of studies that supposedly support their claims but are actually either questionable or irrelevant. We identify this as a relatively new pseudoscience tactic: the promotion of irrelevant research.